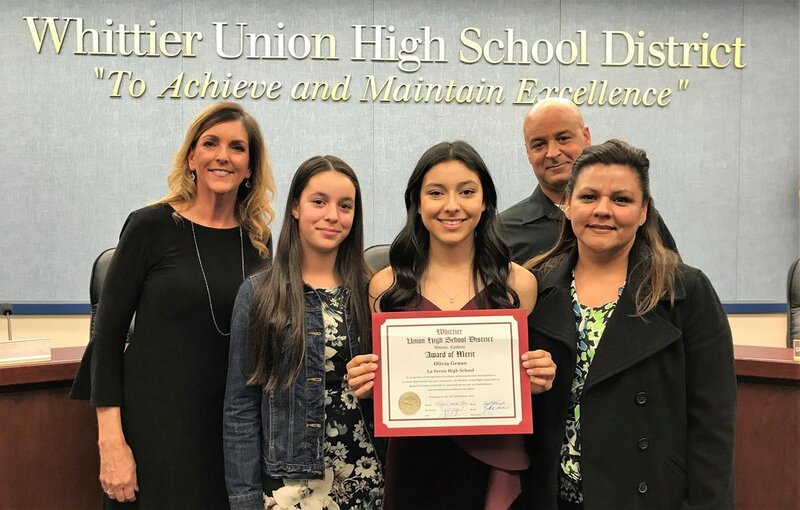 La Serna High School senior Olivia Genao, who gained early admission to Yale University, was honored with an Award of Merit by the Whittier Union Board of Trustees on Feb. 19. Pictured are Genao and Board of Trustees members Dr. Ralph Pacheco, left, Tim Schneider, Clerk Leighton Anderson, Vice President Jeff Baird and President Dr. Russell Castañeda-Calleros. 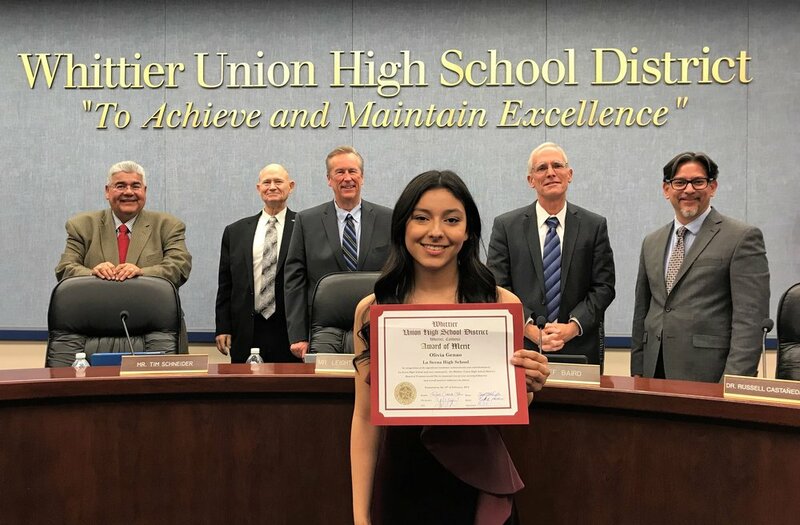 WHITTIER – La Serna High School senior Olivia Genao is a budding artist whose lifelong passion for art, science and math has fueled a remarkable educational journey that has earned her District-wide recognition for gaining early admission to Yale University. Genao, La Serna’s 2019 Student of the Year, was granted early admission to the elite Ivy League campus in December. She is one of 794 applicants from around the world selected to join the Class of 2023 through the Early Action Program. Genao, who plans to major in neuroscience, was offered a full-tuition scholarship. Surrounded by friends and family, the scholar was recognized by the Whittier Union Board of Trustees with an Award of Merit on Feb. 19. Genao, who has a 4.53 GPA, serves as editor-in-chief of La Serna’s award-winning yearbook and has taken 13 Advanced Placement classes – seemingly finding a way to combine her love for the arts, which began when she picked up a camera at 5 years old, with her passion for science and math. Olivia Genao is pictured with Principal Ann Fitzgerald, left, and her family. In 2017, Genao was one of 20 high school juniors selected to participate in a nine-month Women in STEM program at Harvey Mudd College. Later that year, Genao attended the UCLA Nanoscale Microscopy Lab Summer Institute and in 2018 completed a research project at Whittier College. Genao has received numerous honors for her leadership experience, serving as president of La Serna’s National Honor Society and the Whittier chapter of the National Charity League. Genao has also been cited as a National Merit Commended Scholar and AP Scholar with Distinction. Even with a full schedule of classes, Genao has given over 800 hours of volunteer service as a STEM mentor at La Habra Library and hospital ambassador at PIH Health.